Chronic and recurring violence has been the hallmark of post-2003 Iraq, and the lives of ordinary Iraqis are dominated by violent events. Not a week has gone by without some terror attack, explosion, kidnapping or unrest somewhere. Death and crippling injuries, not to mention psychological trauma, have devastated people’s lives. It is shocking and mind-boggling just to look at list after list of the deaths and injuries in Iraq over the past fifteen years recorded by organizations such as the United Nations and Iraq Body Count. Regrettably, recent years have not seen much improvement. For example, at the most recent count, Iraq topped all countries in the number of terror attacks as well as the number of deaths and injuries (U.S. Department of State, 2015, 2016, 2017). In addition, shockingly violent incidents of grave magnitude and impact that caused as many deaths and injuries as the World Trade Center attacks of 9/11, such as the Camp Speicher massacre by ISIS in 2014 and the Karada district explosion in Baghdad in 2016, have hardly been properly investigated as the government stands unable or unwilling to do so. Such events are severely traumatic to the people who are affected by them. Although the focus is always on the number of victims, the physically injured and the mentally traumatized, especially children, must live through this terror for months and years, and sometimes their whole lives. Many who have lived through these events and have not been injured are internally displaced inside Iraq, either because their homes were destroyed during fighting or because they have fled their homes to seek safety; and of the nearly 5 million people who have been displaced, about half are children. They are in a refugee status or living in some unstable condition, vulnerable to attack, abuse and malnutrition. They have feelings of fear, horror and despair (Save the Children, 2017). 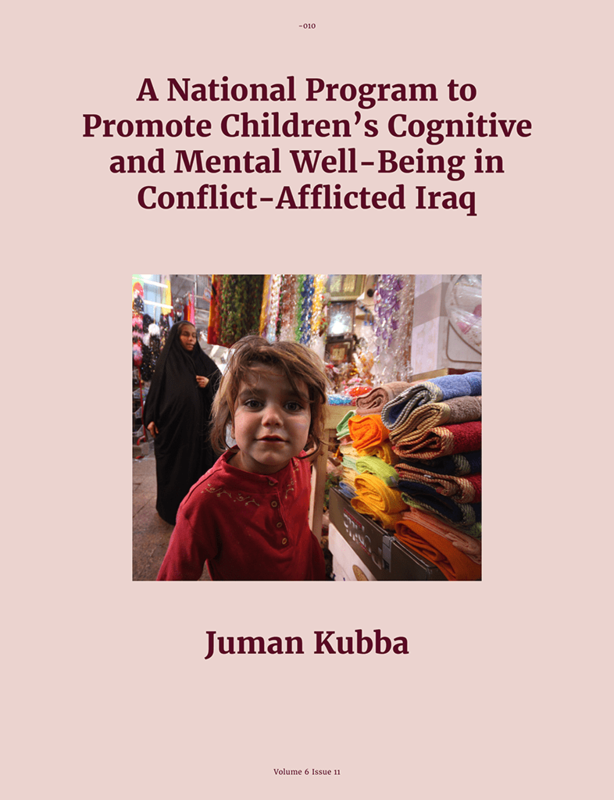 Today in Iraq a whole generation of children and youth have grown up in the aftermath of war and/or terrorism or have had their caregivers lost or incapacitated. Anyone who has visited Iraq in recent years would have been shocked to see children running among cars on the roads barefoot or with worn-out clothes and shoes. Some of those children earn a living in the streets, others are beggars or search for food in rubbish dumps. They do not go to school. Many are homeless and have become prey for crime and drug abuse. These scenes and facts are common to many areas in the so-called new democratic Iraq. Even children in relatively “safe” areas are not off the hook. They suffer from other hazards such as severely crowded classrooms (60–90 children), crumbling school buildings, lack of schools (due to a shortage of some 15,000 new school buildings), malnutrition and stunted growth, which affects around 25% of Iraqi children (UNICEF, 2012). While it is not possible to include all the details in this short article, here I refer to the End of Childhood index (Save the Children, 2017), where Iraq is ranked 123 out of 172, near the bottom of the scale. All these factors are detrimental to health and well-being, and especially detrimental to mental health and cognitive potential. A mental health/educational catastrophe is growing with each passing week, and the ramifications will last for decades to come. Urgent action is needed. Now that months have passed since the Iraqi parliamentary elections, which were held in May this year and have been surrounded by controversy, and 15 years have passed since the 2003 war, it is past time to look at the alarming impact the war and its aftermath (ceaseless violence, poverty, displacement) have had on Iraqi children and do something about it. In post-2003 “democratic” Iraq, the living conditions of children are far removed from the fancy dreamy words like freedom, elections and human rights often used by politicians. It would be truer to say that the lives of these children have been plagued by violence, displacement and hunger, and in many cases also the loss of their caregivers. The 2003 war and what followed—chaos, chronic violence, weak governance, severe decline in public services (health care, sanitation, education, road safety, electricity)—is now being manifest in alarming trends in youth behavior and an unprecedented decay in social structure. Many social problems have emerged, including drug use, suicide, and juvenile violence. A childhood experience that is plagued by hunger and trauma mars brain architecture and physiology, cognition, emotional stability, and ultimately, behavior and life outcomes. Research has shown the grave consequences of early life trauma and adversity on the developing brain, and recent data from human and animal studies have shown the deleterious impact of adverse living conditions in childhood on brain structure and function. Such conditions negatively impact children’s cognitive abilities and psychological well-being for life. It is not within the scope of this article to review the research on this subject, but a few references are listed—see Ivy et al. (2010); the National Scientific Council on the Developing Child (2010); and Nelson (2017). The scientific literature also shows that intervention can promote readjustment of brain circuits because developing brains are malleable and respond to a positive healing environment. This is great. It means that steps can be taken to provide healing programs for children affected by adversity so that they can recover. This has been an excerpt from The Neuropsychotherapist Volume 6 Issue 11. If you would like to read the rest of this article and other great science of psychotherapy, please consider subscribing to this site.